​The NRAC anchor replacement crew has updated hundreds and hundreds of climbs at in the New River Gorge, at the Meadow River and at Summerville Lake. But we have a lot of work yet to do. Your monetary donations will help us replace old, irrelevant and unsafe fixed anchors. A handful of examples of the genre are The Ribbon at Fern Point, Welcome to Huecool at the Bridge area, The Beast in Me, Right Son of Thunder, and Genocide at Beauty, Superstition at the Cirque, Bubbas at Arapiles at Endless, and Chasing Rainbows at Ambassador. Of course many of the popular routes were re-equipped as well including Chunky Monkey, The Warm Up, Oyster Cracker, Green Envy, and much of the White Wall at Kaymoor. Over the years we have attacked old hardware at the Lake, Kaymoor, Junkyard and pretty much every crag you can name. On the hardware front standards were also improved. With the new NPS minimum requirements for hardware now being ½” stainless or equivalent, NRAC was purchased much new hardware to fill the tool shed void. Jim Taylor, owner of Appalachian Climbing School, brought some high quality glue-ins to the table to help fill the need. Bolt Products out of Germany makes a super strong “twizzler” style eye bolt that tests out at amazing breaking loads. Many routes at the New were re-equipped with these fasteners and will probably never have to be equipped again…. 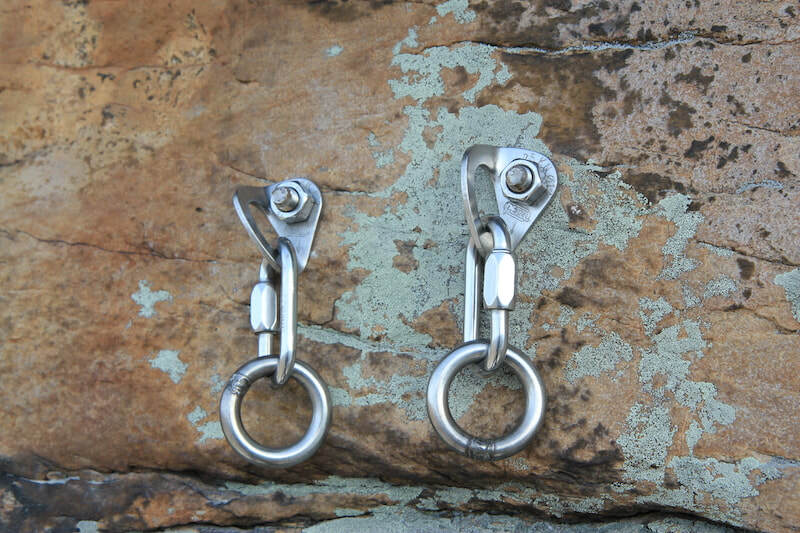 Petzl Long Lifes, 12mm stainless wedge anchors and glue ins were also added to the quiver providing a variety of options for routes of varying steepness, rock quality, and moisture situation. NRAC also purchased a new Hilti TE 7A drill which continues to see action and has more than earned it’s keep in the NRAC tool cabinet. The Anchor Committee is set up now with a tool cabinet stocked with several complete bolting kits, two Hilti drills with several extra batteries for each, and a stockpile of hardware for all applications. So, coming years should be productive for anchor replacement at the New River Gorge. Of course this is the point where we solicit YOUR help with this campaign. If you love to climb at the New and would like to be a part of this ongoing effort here’s what you can do. Come to the New River Appalachian Outdoor Film Festival! This event is the prime fundraiser for NRAC and is how we can afford to do the work that we do. By attending the Film Festival, not only do you get to enjoy all the fun, you get the satisfaction of knowing your money and any volunteering you do goes to a great cause.